What's so special about UYA? Sujet : What's so special about UYA? No, it's not some kind of trolling intended to piss you off. It's not April Fools either. 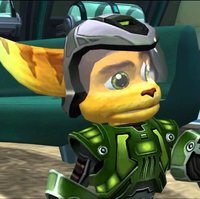 It's a question that has been bugging me for quite some time - what is so special about Ratchet & Clank: Up Arsenal? Wherever I go I hear this is the best, the perfect, the most epic Ratchet & Clank game. Why? Except for the great script… There's nothing to me. 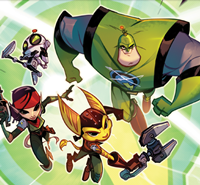 Sure, it does add a few notable tweaks to the mechanics of the game, but other than that… It's just GC all over again, only this time platforming is limited to the boring Qwark levels. There is not much interesting gadgets, there's no boss that come even close to that Thug Mech of GC, the graphics are worse… Seriously, what does this game have to offer, that the previous two didn't (aside the story department). If IG wanted to make a shooter so badly, why didn't they jump straight to DL? Now, don't get me wrong, I don't hate this game, but I find it pretty mediocre for the series' standards. This is just my opinion and you are free to disagree with me (and I'm pretty sure you are going to). That Thug Mech is probably the worst part GC. From an HD perspective, UYA is higher, but GC had better graphics than UYA and DL. It seemed as if the games started focusing less on detail and more on shooting. GC is better than UYA IMO, but UYA still had great soundtracks and a really good storyline. I guess it doesn't help that UYA was the buggiest of all the HD trilogys. I shall try to refute! I don't see how it has worse graphics than GC. UYA's animations, shapes and colours are simply more vivid (notice how most of the levels in the game happen during the daytime, unlike R&C1 and 2), and I like it better for it. The soundtrack is pretty fun too. It's not as varied as GC, I'll give you that, but at the same time it doesn't need to be. All of the tracks in UYA are so catchy and in-your-face that you don't mind having a few of the ambient pieces axed off. The weapons are pretty cool and crazy too, mostly in how they operate. Something about how an explosion looks and sounds just makes a shot feel right. UYA's weapons are all wonderfully constructed in this way, even if not all of them explode. These are all true things Darkstar, I did forget to mention animation is done much better here. However, that still doesn't make it as good as the previous two in my eyes. I think GC and UYA are the two best games in the series, but here's why I think UYA is better than GC. UYA on the other hand, has many more planets that are designed in the way that I prefer. GC has more variety in gameplay, but I don't think that's automatically a good thing. I don't like being forced to do the space missions most of the time, and I definitely don't like being forced to do those hoverbike races. Galactic Ranger missions are kinda what I consider the replacement to those forms of "side gameplay" and I think they're much more enjoyable. Arsenal is better in UYA. GC has a great selection of weapons, but it's smaller AND not as still balanced as UYA's arsenal. Of course, UYA's isn't perfectly balanced, but there are definitely more viable weapons by the end of the game you can use in UYA as opposed to GC. I prefer UYA's soundtrack to GC, though they're both my favorites in the series. I thought the reflector was a cool gadget. The hacker was OK. I don't exactly commend GC for having two different wall hacking puzzle gadgets, but yeah the other gadgets in GC were pretty cool, I'll give it that. I just realized this thread is old, but I already typed this up so I'm posting. 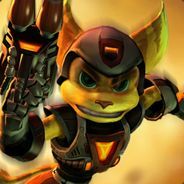 Some pretty good information there loads of stuff I never actually noticed :P I also thought the humour was better in UYA compared to GC,Ratchet and Clank 3 had some pretty funny moments in my opinion and it's probably the funniest Ratchet and Clank game so far.